Ghosts and guns! That's what June will bring to you from Steve Jackson Games. 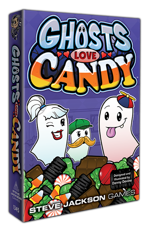 We'll release Ghosts Love Candy, a game about ghosts haunting kids to get their candy, as well as Munchkin Pathfinder 2 – Guns and Razzes, an expansion to our popular Munchkin Pathfinder series. Check out all the phantoms and firepower! It's Halloween and you're a ghost who loves candy! In this adorable game for ages 8 and up, the players are all ghosts haunting cute, costumed children on Halloween night! You want the kids to grab you the most candy, but you have to be careful not to haunt each one too often. They might get scared and run away, and that gets you negative points. This game came from Kickstarter, where fans helped it meet its funding goal. But it didn't deliver, so Steve Jackson Games picked it up to make sure these ghosts could materialize. It's a spooky good time for three to six phantoms. Preorder it at your friendly local game store! 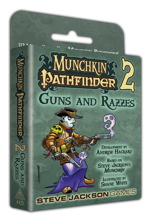 This new expansion to Munchkin Pathfinder gives players the Gunslinger class and a new faction: the Razmiran Vision. The Gunslinger class specializes in firearms (always the best specialty for a fantasy character), and the Razmiran Vision faction lets players benefit from backstabbing. It's a 112-card expansion that draws on the rich Pathfinder lore. You can also pair it with Munchkin Pathfinder Guest Artist Edition! And that's it for June! Watch out for these two new titles at your local game store when the temperatures start to climb.